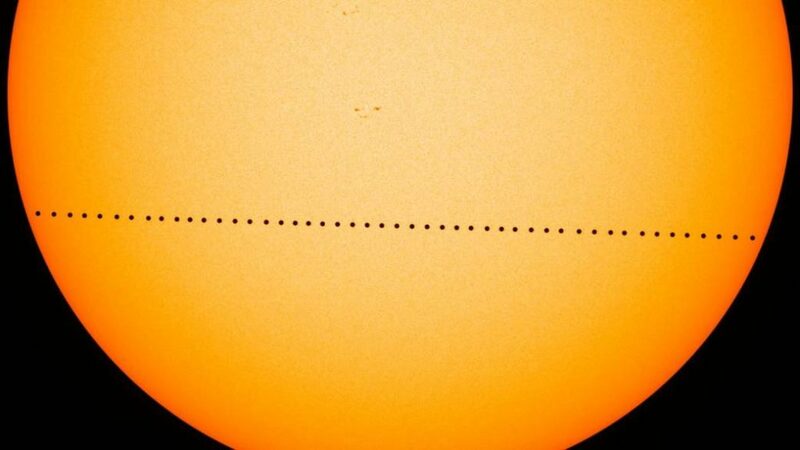 March 10, 2016 – About 13 times per century, Mercury passes between Earth and the sun in a rare astronomical event known as a planetary transit. The 2016 Mercury transit occurred on May 9, between roughly 5:12 a.m. and 12:42 p.m. MDT. Throughout the U.S., sky watchers were able to watch as Mercury appeared as a tiny black dot moving in front of the sun’s blazing disk over a period of seven and a half hours. Although Mercury zooms around the sun every 88 days, Earth, the sun and Mercury rarely align. And because Mercury orbits in a plane that is tilted from Earth’s orbit, it usually moves above or below our line of sight to the sun. As a result, Mercury transits occur only about 13 times a century. Transits provide a great opportunity to study the way planets and stars move in space – information that has been used throughout the ages to better understand the solar system and which still helps scientists today calibrate their instruments. Mercury transits have been key to helping astronomers throughout history: In 1631, astronomers first observed a Mercury transit. Those observations allowed astronomers to measure the apparent size of Mercury’s disk, as well as help them estimate the distance from Earth to the sun. “Back in 1631, astronomers were only doing visual observations on very small telescopes by today’s standards,” said Mayo. Since then, technological advancements have allowed us to study the sun and planetary transits in greater detail. In return, transits allow us to test our spacecraft and instruments. Scientists for the Solar and Heliospheric Observatory, or SOHO (jointly operated by NASA and ESA, the European Space Agency), and NASA’s Solar Dynamics Observatory, or SDO, worked in tandem to study the May 9 transit. The Hinode solar mission also observed the event. Hinode is a collaboration between the space agencies of Japan, the United States, the United Kingdom and Europe led by the Japan Aerospace Exploration Agency. SOHO launched in December 1995 with 12 instruments to study the sun from the deep solar core all the way out to the sun’s effects on the rest of the solar system. Two of these instruments — the Extreme ultraviolet Imaging Telescope and the Michelson Doppler Imager — were brought back into full operation to take measurements during the transit after five years of quiescence. Such data is another piece of a long line of observations, which together help us understand how the sun changes over hours, days, years and decades. SDO used the transit to help with instrument alignment. Because scientists know so precisely where Mercury should be in relationship to the sun, they can use it as a marker to fine tune exactly how their instruments should be pointed. A transit can also be used to help calibrate space instruments. The utter darkness of the planet provides an opportunity to study effects on the observations of stray light within the instrument. The backside of Mercury should appear black as it moves across the face of the sun. But because instruments scatter some light, Mercury looks slightly illuminated. Scientists run software on the images to try and mitigate the effect and check whether it can remove all of the scattered light. SDO recorded images of the Mercury transit, which have been compiled in this time-lapse footage that can be viewed here. SDO includes three instruments: the Extreme Ultraviolet Variability Experiment (EVE) built in partnership with the University of Colorado at Boulder’s Laboratory for Atmospheric and Space Physics (LASP), the Helioseismic and Magnetic Imager (HMI) built in partnership with Stanford University, and the Atmospheric Imaging Assembly (AIA) built in partnership with the Lockheed Martin Solar & Astrophysics Laboratory. Data collected by the spacecraft is made available as soon as possible after it is received.